I am SUPER excited to share this fabulous news with you! Click on image to book your session today! On April 22, 2017, I am hosting a special Mother's Day promotion. These contemporary beauty portraits make a great mother's day gift, whether you're gifting mom, an aunt, a grandmother, or you're a mom who needs to treat herself a little (and seriously, what mom doesn't??!!). It can be a family portrait, a generations portrait (grandmother, mom, child, etc...), a maternity portrait, a portrait of just the children, or even just mom herself. To make this event extra special, I have rented a stunning studio space, Two Mills Studios in Almonte. I will also have a talented makeup artist on site for a camera-ready makeup application, treats & refreshments, and one lucky mama will get an extra special prize! Please note that these are NOT glamour sessions. Makeup application is soft and natural. The goal is to make you look as spectacular in the photos as you do in real life. Clients will have the opportunity to connect with the makeup artist prior to the session to discuss any concerns, special requests and expectations. Who are these sessions intended for? 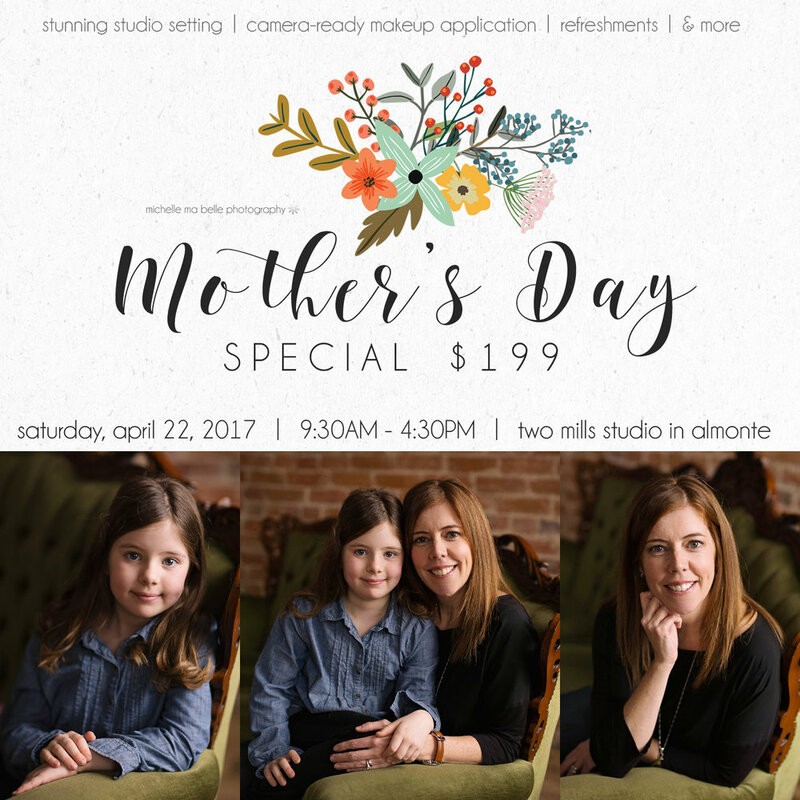 These sessions are designed to celebrate Mothers, however they are open to the entire family, including Dad. Family dynamics can vary, of course, so there are no age restrictions. It can be a new mom, a veteran mom, a grandmother with her grandchildren, a mom-to-be, etc... up to 5 subjects. What do I need to book a session? You can book your own time slot HERE. When your booking request is received I will confirm your time and send you an invoice. A 25% deposit is required within a week of booking your session online after which your time slot will be released. If you do not see any time slots open, please contact me. Can I opt out of the makeup application? The makeup application is included in the session fee - take advantage of it! I know a lot of women worry about "too much" makeup but I assure you, these are NOT glamour sessions. The purpose of the makeup is to give you a photo-ready finish, not change your look. You will have the opportunity to connect with the makeup artist prior to the session to discuss any concerns, special requests and expectations. Can more than one subject have makeup applied? Absolutely! An additional make-up application is $35 for an adult or $15 for a child. These fees are payable in advance of the session. Please notify me prior to your session if additional makeup is required. How much is needed for the makeup application? I ask that you arrive 40 minutes prior to your session to make sure you have plenty of time for makeup and/or any touchups. There is a beautiful sitting area and I will have refreshments for you, so just enjoy the time "off". What can I purchase with my $25 print credit? You can use the $25 towards gift or gallery prints, wall art, albums and more. You can order print products of any image in your gallery, not just those you've selected for download. A price list and product samples will be available at your session. Absolutely! Please contact me if you would like to gift a session. Have another question? Contact me and I'll get back to you within 48 hrs.